Dueling Pianos Video of the Week – American Pie! | Shake Rattle & Roll Dueling Pianos NYC | The Best NYC Dueling Pianos bar shows - all request Dueling Piano parties for Birthday, Bachelorette and more! Dueling Pianos Video of the Week – American Pie! 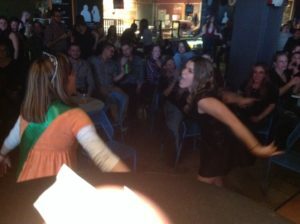 Our SOLD OUT Pennsy crowd celebrates birthdays and bachelorette parties with a singalong of AMERICAN PIE!